This issue of Medical Clinics, guest edited by Drs. 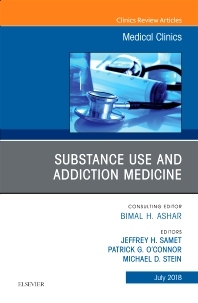 Jeffrey H. Samet, Patrick G. O'Connor, and Michael D. Stein, is devoted to Substance Use and Addiction Medicine. Articles in this outstanding issue include: Making Unhealthy Substance Use a Part of Behavioral Health Integration in Primary Care; The Inpatient Addiction Consult Medical Service: Expertise for Hospitalized Patients with Complex Addiction Problems; The Addiction Physician Workforce: Addiction Psychiatry and Addiction Medicine Collaboration in a New Age; Preventing Opioid Overdose in the Clinic and Hospital: Analgesia and Opioid Antagonists; The Role of Non-Traditional Maintenance Treatments: Injectable Opioid Agonist Therapies and Managed Alcohol Programs; Office-Based Addiction Treatment (OBAT) in Primary Care: Models that Work; Alcohol Use Disorder Pharmacotherapy: the Use of FDA and non-FDA Approved Medications; When and How to Treat Possible Cannabis Use Disorder; Clinical Presentations of New Drugs with Abuse Potential; Use of Technology in Addiction Therapy; Sleep Management Among Patients with Substance Use Disorders; Pain Management Among Patients with Substance Use Disorders; E-Cigarettes: A Path to Recovery or a Road to Hell? ; Are Adolescent and Young Adults Different When Addressing Substance Use Disorders? ; and Smoking Cessation for Those in Recovery from Substance Use Disorders.